MRT III®: The Future of Food Sensitivity Testing - Oxford Biomedical Technologies, Inc.
Oxford’s latest innovation is the MRTIII® instrument. MRTIII® is the world’s most advanced and reliable instrument for measuring the subtle volumetric changes that occur in hidden inflammatory reactions to foods and food-chemicals. The single common feature and most clinically important component of all diet-induced inflammatory reactions is that they ultimately cause mediator release (cytokines, leukotrienes, prostaglandins, etc.) from various white blood cells (neutrophils, monocytes, eosinophils, lymphocytes). This is true whether reactions are immediate or delayed, whether dose dependent or not, whether governed by the innate or adaptive immune systems, whether cell-mediated or humorally-mediated, and whether inflammation remains at a sub-clinical level or becomes symptom-provoking. All food-induced inflammatory reactions involve mediator release, which is the single most important event leading to all the negative effects food sensitivity patients suffer. 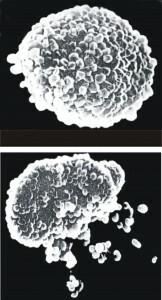 Mediator release corresponds to volumetric changes in neutrophils, monocytes, eosinophils, and lymphocytes. MRTIII® provides unmatched reliability and precision because it is the only instrument in the industry that combines advanced flow cytometry technology with the patented impedance-based “Ribbon Method.” MRTIII®, along with Oxford’s patented “Ribbon” method, is the only instrument capable of measuring the subtle volumetric effects of antigen challenge on individual white cell populations simultaneously (lymphocytes, eosinophils, monocytes, neutrophils). And because MRTIII® is able to identify more relevant inflammatory reactions than any other test or method, therapeutic outcomes are maximized with its use.